Women's football will be given a deserved spotlight at the Ulster Footballer of the Year Awards, and the Belfast Telegraph can exclusively reveal who has made the final cut for the inaugural female player's gong. 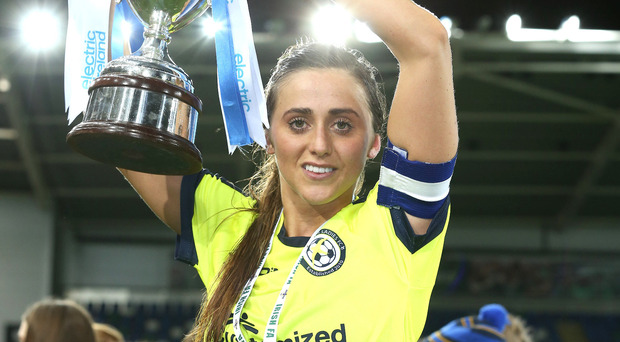 The independent judges have selected a born leader with natural creativity, Northern Ireland international Kendra McMullan, who has captained Sion Swifts for five seasons and emerged the two-goal hero in the club’s Challenge Cup final win over Newry City back in September. The second finalist is Linfield’s Kirsty McGuinness, who has been described by club secretary Neil Morrow as “the complete package”, having been the league’s top scorer with 16 goals in 12 league games. Her club team-mate Lauren Perry completes the trio, having kept a record nine clean sheets for the Blues and earned a senior cap aged just 16. Sion Swifts boss Tony McGinley said: “Kendra came on board in 2013, so we’re coming into her sixth season with the Swifts. “She was instantly made captain, and over the years she’s been here she has developed both as a person and a player immensely. She’s grown into a tremendous team player and a great ambassador for the club. “Players come and go, but Kendra has been extremely loyal. She is also always the first to welcome new recruits. Morrow has also helped to shape Perry’s development, and the 16-year-old’s defining year. Having been fast-tracked into the senior women’s side after a sterling performance in the Uefa Women’s U19 European Championship, Perry is now regarded as one of the country’s leading young talents between the sticks. She began playing football aged seven with Ballynahinch United as a left-back, and less than a decade on is now sporting a Premiership winner’s medal and Champions League experience. The Women’s Footballer of the Year award was introduced to recognise not only the country’s talented club players, but also the sport’s growing popularity.